May you skip with joy in the new year! After living for three years in the state of Arauca, I joined the Christian Peacemaker Team here in the city of Barrancabermeja on September 16. I’ll be returning to Arauca occasionally to visit friends and I’d like to share with you now a few of my favorite memories of that very beautiful and afflicted region. Martin Sandoval and 13 other people were arrested for “rebellion” in the town of Arauquita on November 4, 2008. 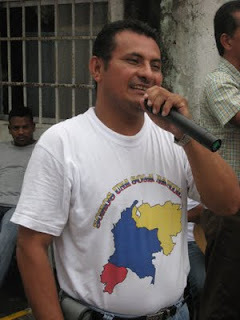 Martin is the president of the Permanent Committee for the Defense of Human Rights in Arauca. The Committee organized a public hearing of the Congressional Human Rights Commission in Arauquita on July 31, 2008. More than 500 people attended that hearing during which Martin and other community leaders denounced the abuses committed by the army and police. Leaders of the Committee felt that Martin’s imprisonment was in retaliation for organizing the hearing. Alejandra was two years old when I moved to the town of Saravena in 2006. She lived a block away, and she would wave and call out “Gringo!” whenever I walked by. One evening when she was three, she ran down to the corner to meet me and was so excited that she started skipping back to her house. That seemed like an excellent idea to me and I began skipping alongside her in the street. This turned into our evening ritual and we would skip together along the entire block. Unfortunately, after Alejandra turned four she became too self-conscious to continue skipping (I hope she grows out of that by the time she reaches my age). After several skip-less months, a young girl who lives across the street from Alejandra called out to me one evening and started skipping. She had seen our previous ritual and wanted to join in the fun. I crossed the street and we skipped together to the corner. She and a younger friend became my new skipping buddies and the evening ritual was revived.